... to Fans, the fanlisting for TheFanlistings.org! TFL has been uniting fans since 2000 and I'm very proud to be a part of this awesome community, as a fanlisting owner and also as a staffer! If you are a fan of the wonderful place that is thefanlistings.org, come join the fanlisting! 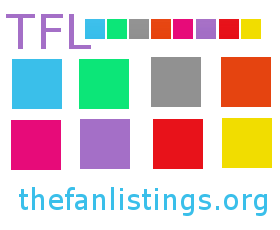 We are listed with The Fanlistings Network under the Websites category. Thank you to Tonya, for her members list and buttons!